This review is a little belated and will become obsolete within a month or so as Linux Mint 17 is on the way and Linux Mint 17 will be the LTS release. So why bother reviewing it? I have been meaning to review Linux Mint 16 for quite some time but haven’t quite had the time. It is also the case that Mint doesn’t change so much between each release that it necessarily requires a new review every time. This review is aimed at people who have heard of Linux Mint but who haven’t yet given it a go. I am not advocating that you replace Windows right now with Linux Mint 16 as you would be better off waiting for Linux Mint 17 whereby you would have a supported operating system for years to come. 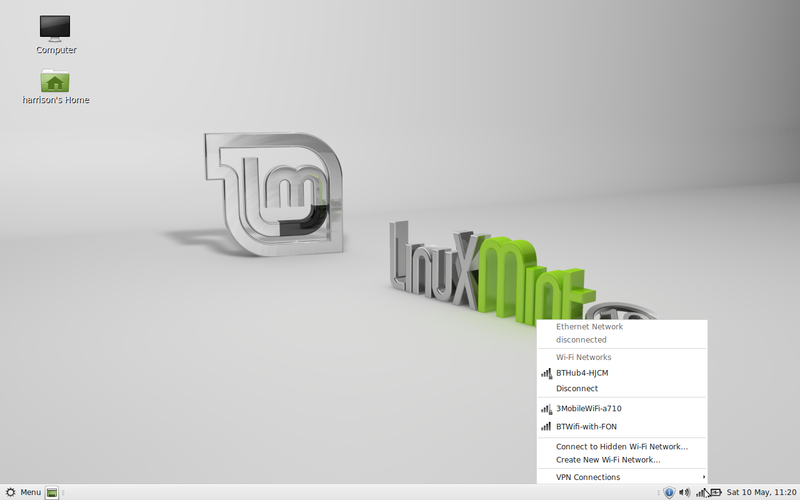 You might like to try Linux Mint 16 in a virtual machine however or try it out as a Live USB. Give it a spin and see if it fits your needs. 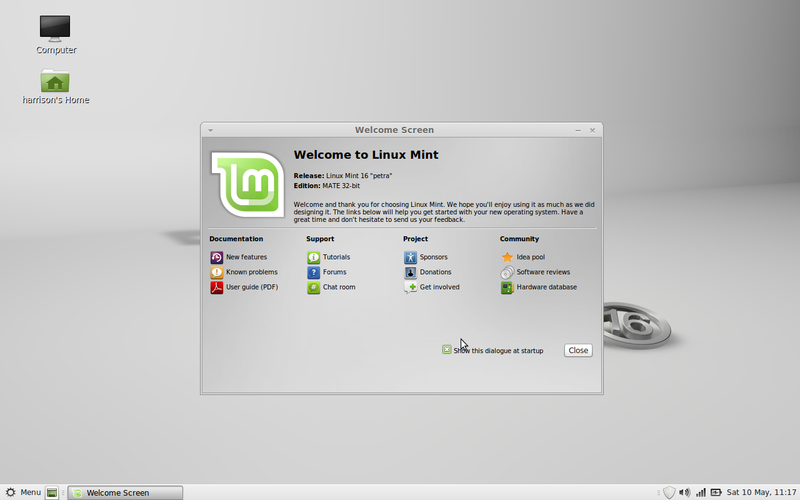 Click here for a guide showing how to install Linux Mint 16 in a virtual machine. Click here for a guide showing how to create a Linux Mint bootable USB drive. For those of you wondering how difficult it is to install a new Linux based operating system I would just like to say that I didn’t install Linux Mint 16 on this computer. Instead, I gave my 12 year old son the instructions and left him to it. Within 20 minutes my son had successfully installed Linux Mint 16 and was connected to the internet. He found navigating around Linux Mint a breeze and is planning to install it in place of Windows 7 on his own laptop when the new version arrives. 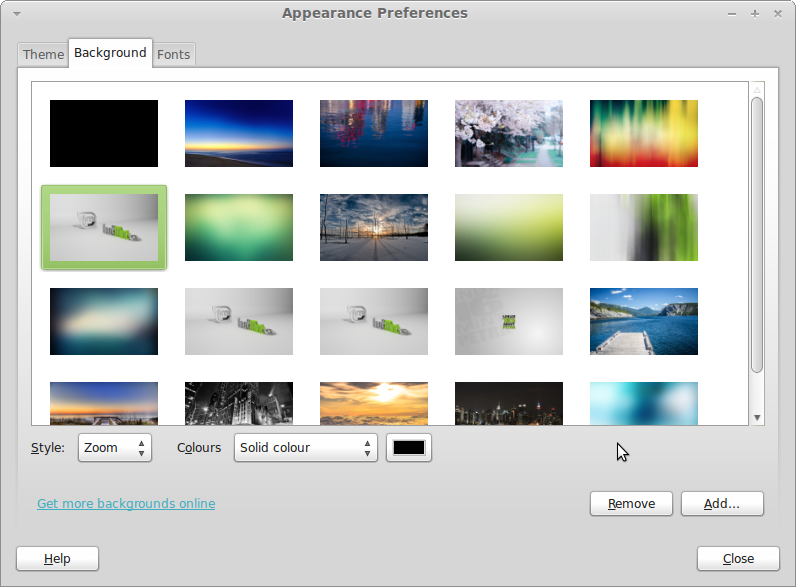 The version of Linux Mint that I am reviewing is the lighter MATE desktop as opposed to Cinnamon. You will be greeted initially by a welcome screen with links to useful resources. You can visit these resources or if you prefer you can uncheck the “Show this dialogue at startup” box so that this window no longer appears. In the top left corner you have icons for accessing your computer’s folders and your home folder which is where you will store documents, photos, music etc. The bottom of the screen includes a panel much like all versions of Windows with a menu icon in the bottom left and a system tray in the bottom right. The system tray includes icons for notifications, audio settings, network settings, power settings and a clock. The menu system in Linux Mint MATE is more intuitive than the old Windows menus. The left pane includes access to your computer, home folder, network folder, desktop and trash folder. There are also links to the software manager, package manager and terminal. The right pane has two main views. The view shown above has a list of categories and if you click on a category the applications for that category are displayed. The other menu view shows your favourite applications and is a list of icons to the most useful applications such as browser, mail client, media player etc. Notice that there is a search box. If you can’t find the application you are looking for type the name or some keywords and a list of possible programs will be displayed. Connecting to the internet is as easy as clicking on the network icon in the system tray and choosing the required network. If you are on a wireless network you will be asked for the security key unless it is an open network. Your network connections are remembered, so the next time you boot up you will be automatically connected. 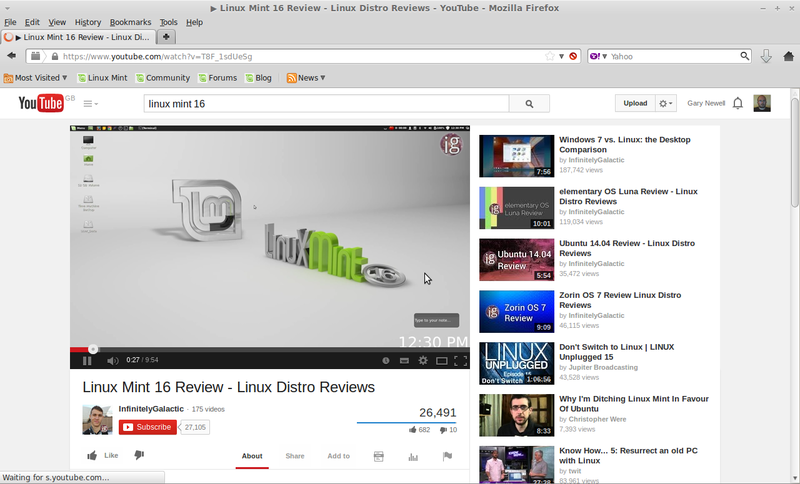 The web browser for Linux Mint is Firefox which is probably the best web browser available at the moment. There are a number of things that make Linux Mint the most complete and easy to use operating system. One of those things is the inclusion of all codecs and drivers required to play music, watch videos and play online games. Linux Mint includes by default all the software most people would use on a daily basis. 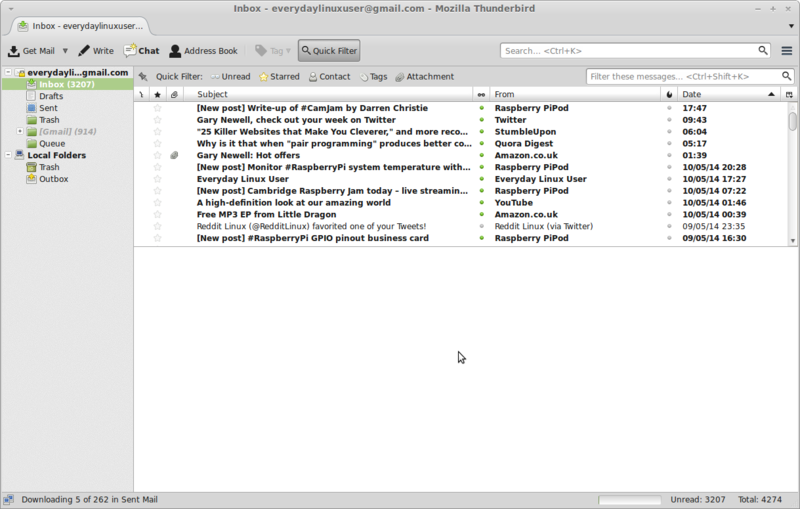 Thunderbird is not just one of the best email clients for Linux, it is one of the best email clients full stop. As well as making it easy to connect to your desired email service you can also use it as a chat client and a place to read your favourite RSS news feeds. Pidgin is an instant messenging application which can connect to services such as AIM, ICQ, Yahoo and Google Talk. If you have been reading my series about the KDE applications then Pidgin is similar to Kopete. 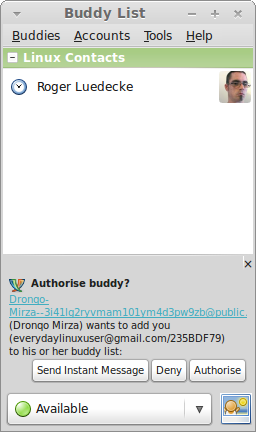 Linux Mint also includes XChat which is an IRC client. Again if you have been reading my series about KDE applications then it is fair to say that XChat is similar to Konversation. 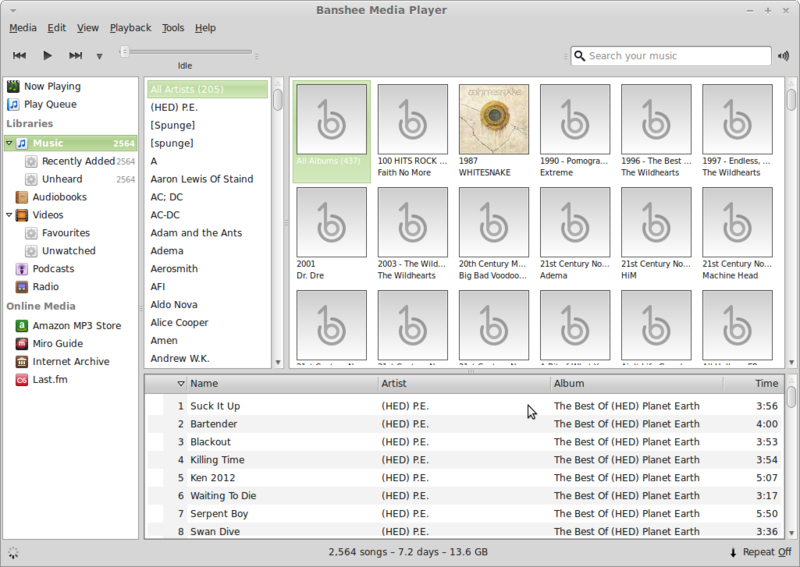 The audio player included with Linux Mint is Banshee. Whilst it is a good audio application I have to say that my personal preference would be Rhythmbox. Rhythmbox seems to work better with other audio devices such as the Sony Walkman. Banshee is easy to use though. Simply choose the folders to use to import music from and you can then build playlists and start listening to your tunes. 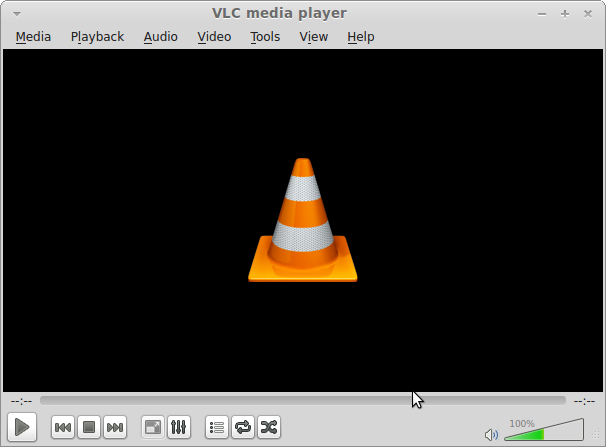 The default video player in Linux Mint is VLC which is used pretty much everywhere nowadays. 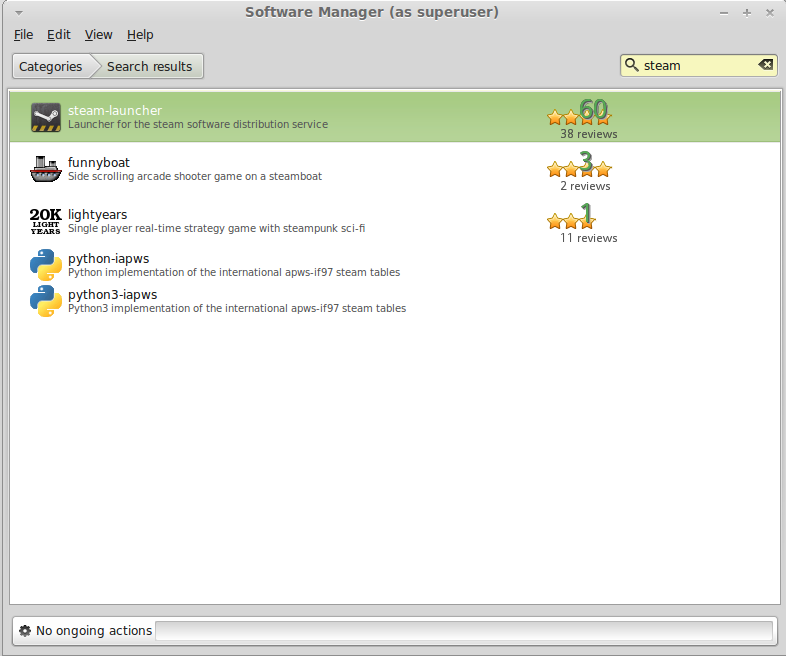 Linux Mint has its own software manager which links to the Mint software repositories, enabling you to search and install the software packages you need to use. There is a search box in the top corner and you can search by title or by keywords. You can also browse each category if you just want to browse. The Mint software manager is probably the best example of a graphical package manager. 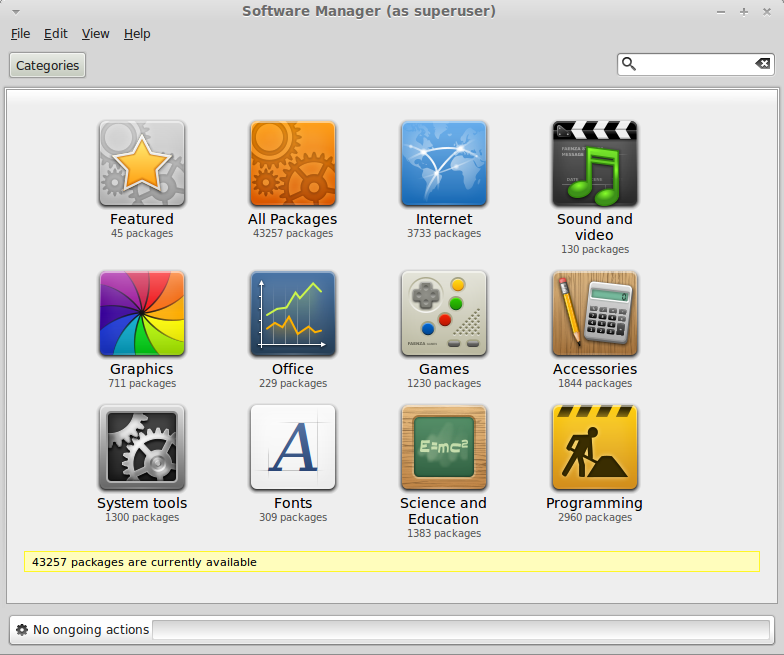 Linux Mint also includes the Synaptic Package Manager which is a more complete tool for filtering and managing your software needs. Linux Mint has a decent set of repositories and as it is based on Ubuntu, every software package you could possibly need is available. 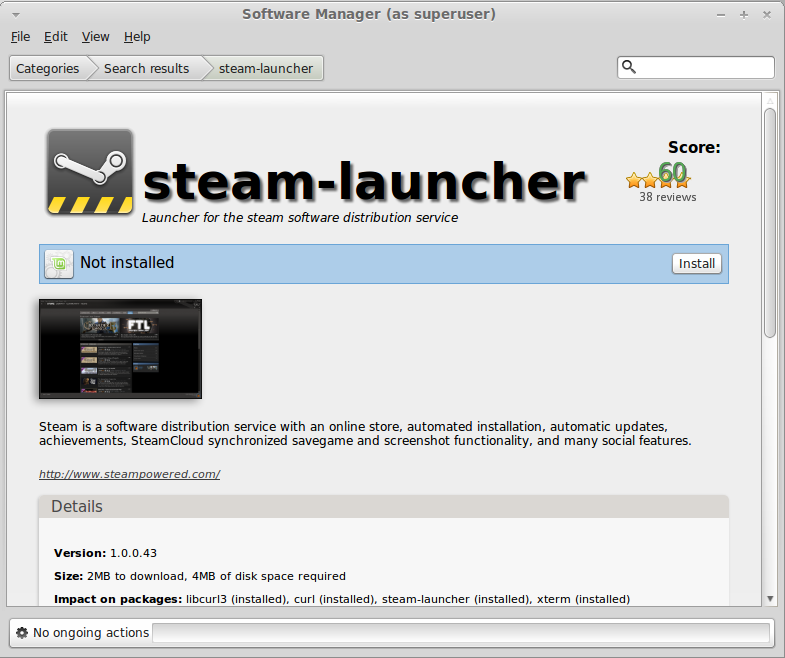 Gamers will be pleased to see the Steam installer included within the software manager. 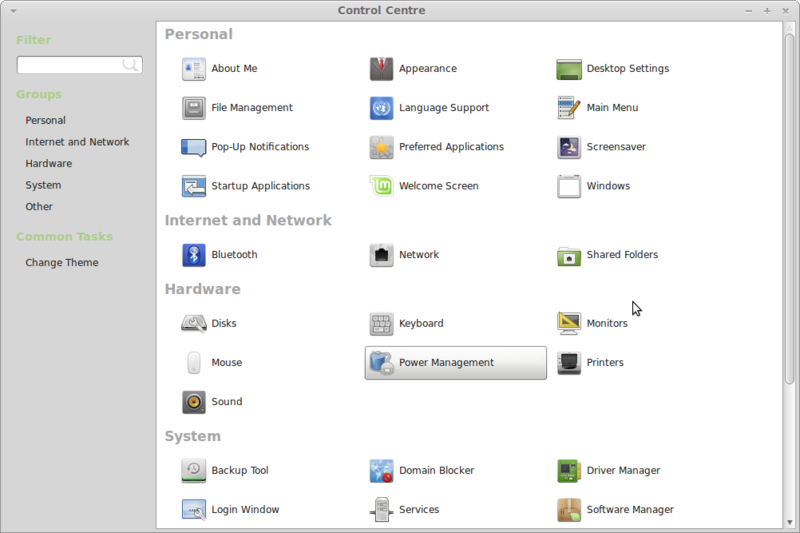 The Linux Mint Control Center is provided to let you control all aspects of your operating system including the setting up printers, managing disks, drivers, monitors, networking, bluetooth, and so on and so on. You can also change your desktop wallpaper from here (or right click on the desktop and choose change desktop wallpaper). 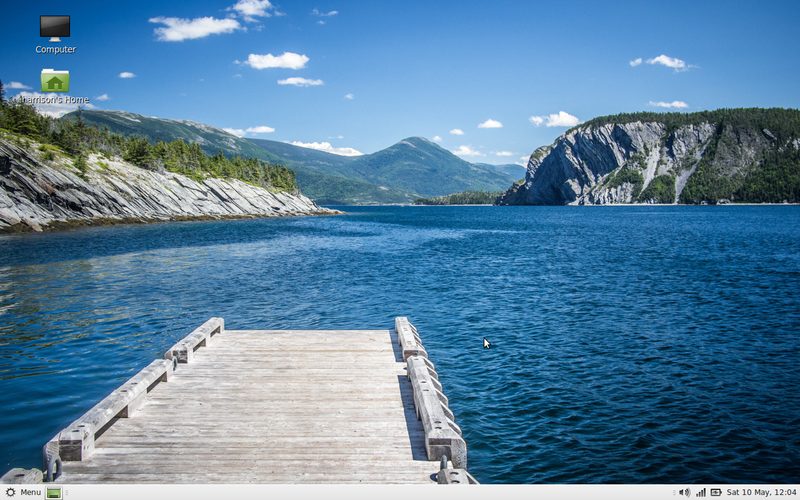 There are a number of wallpapers included with Linux Mint or you can choose one of your own. It is easy to see why Linux Mint is so popular. There are versions of Mint available for computers of all specifications from older P4s to the latest i7 processors. The desktops are familiar looking for anybody who has been using computers in the past 20 years and it is so easy to use. There is a complete range of software and the software manager is perfect for finding and installing something that isn’t included by default. Users who are worried that using Linux means using the command line needn’t worry because you really don’t need to with Linux Mint. It is a toss of a coin for me as to which is better for the ordinary computer user, Linux Mint or PCLinuxOS. 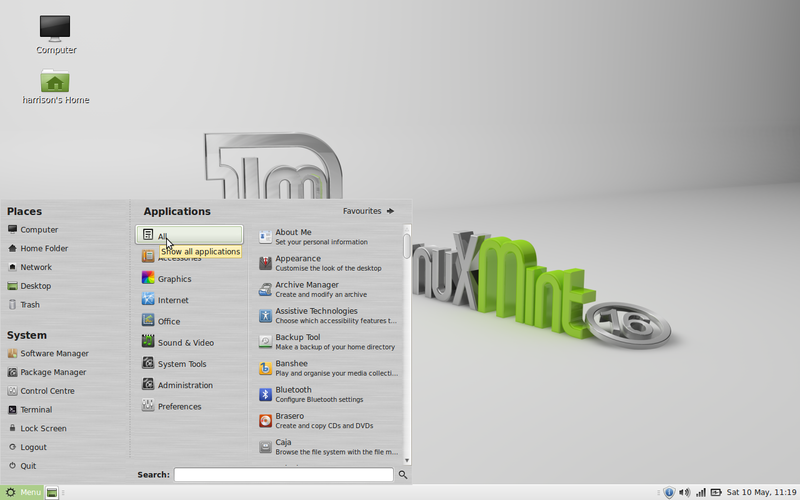 Linux Mint probably is the most complete and easy to use operating system. I would recommend waiting until Linux Mint 17 before new users rush to wipe their current operating system and go 100% Linux simply because of the support aspect. It is definitely worth trying Linux Mint out in a virtual machine as preparation and as a demonstration whilst you are waiting. Ah. that doesn't look like VLC. I think they meant the content of the video player and where it came from. That so called VLC screenshot is not even VLC I think. I think this is Totem, not VLC. Gary, what do you think of Linux Mint Debian Edition? Is it as good as the main edition? It's a rolling release so you would never have to re-install when a new version comes out. I haven't tried it yet. Will give it a go soon. I have a review for Makulu coming up this week so I am concentrating on that review at the moment. Yeah, I recommend Linux Mint Debian Edition. It gives very little up compared to other editions of Mint; it's pretty much the same installation program. A few of the utilities differ slightly, but most of it looks and behaves about the same. The main difference is that the software comes from Debian Testing instead of Ubuntu; to me that makes it a little more stable, but LMDE developers do evaluate it and test it, so it's really pretty solid and stable; to me, as much so as the other releases; recommended! Easier to install and just keep it handy; I have it on the hardware I'm using now, a Lenovo 3000 series Y410 laptop, a unit that's about five years old. I love Linux Mint, but not sold on the upgrade plan. To upgrade to next version requires reinstalling, whereas with Xubuntu it's just click the button to upgrade. On the other hand, Linux Mint has a lot of "ease-of-use" tweaks, and it will have long-term application support. I just wish the Mint team would figure out the upgrade path so it would be a little bit easier on the end user and not require burning an install DVD and running installation all over again, losing all the configuration in the process. Really and truly the only thing *buntu has over Linux Mint at this point is the magical upgrade button. Gary, my son, back when he was seven, got on one of my old computers early one morning; I told him he could, but I figured that he'd have enough trouble getting it going that he'd need to "wait for daddy". Oh no, that didn't matter. No matter than the old system only had one window manager, Fluxbox, installed on it; no matter that Fluxbox uses right mouse clicks and does nearly everything differently. By the time I joined him he was already happily playing a game. I just spoke to my son the other day. He says he has an old Mac OS X (he thinks it's version 4 or something like that). The other system he has is a really old Dell Latitude D600 with a version of either antiX (or he thinks possibly PCLinuxOS), I told him if he has PCLinuxOS and KDE on that old system, he may want to put antiX on it instead so that it runs faster. He then told me that he still has an old copy of KNOPPIX laying around. This is the same son who also got on the Internet at about the same age, using a PSP – Play Station Portable – found someone's Open Wifi router, got on the Internet, then figured out how to make free phone calls by getting one or two call subscriptions to Skype and a variety of other phone services. His PSP did not have a microphone but it did have a speaker, so he could call people, hear them say "Hello" and then he'd laugh. Dangerous kid around computers when not closely watched, coached, and monitored! He's older now (13) but still prone to monkey business unless he is under a watchful eye. So having a kid install something means nothing. My great nephew a year or two ago when he was three, called his Dad one morning when his Dad was stationed overseas. My sister was there and saw it. He said, "grandma, I'm just going to check my email". Next thing you know he was calling his very surprised Dad at his military station. Dad had to tell his son that "dad is working" and we'll have to talk later, but he asked how he got on; my sister told her son, his dad, that he did it all himself, and he did it very quickly. THREE YEARS OLD, Gary! A better litmus test is asking someone who is 85 years old or older to try either using or installing a Linux system. My mom, turning 87 this year, can use computers, but generally needs assistance. I have, however, had her use Linux Mint, Xubuntu, Lubuntu, and antiX on a Dell Latitude laptop before I bought her a Nook HD tablet — that's easier for her to handle; it's an Android-based system with a Linux kernel and a very easy to use user interface; she seldom needs help, so I think I've found the right device for her! I also am new to Linux had dumped Ubunto but found Mint easy to adjust to and like it. Not happy about having to burn new dvd to upgrade to Mint 17. Do I need to uninstall 16 to accomplish that? And not sure on how to uninstall 16. In time ..er a fair while from now MP3 will hopefully be forgotten and replaced with the much better sounding and smaller use of file space file already out there called Ogg and its higher quality cousin the Flac file. These things occur if you take a look at using and start using them. I can say that I love Mint 16….can't wait for the KDE release of Mint 17. I think Windows XP was my last Microsoft based OS. Looking forward to the day when I say "I don't do windows"
I started playing with Linux for the first time about 6 months ago, looking to replace XP on my Dell D610 (still going strong, using it as a desktop with external monitor and keyboard). In doing research there were several suggestions…so first I tried Zorin, then Mint 16…first MATE, then Cinnamon. Played with them as dual boot, trying out various things. LOVED Cinnamon. Finally dumped everything on the computer and went strictly to Cinnamon. Then started playing with it on my Dell Mini 10 netbook running Win7 Starter. Tried Mint Cinnamon, Ubuntu, then Mint with XFCE. Went with Mint XFCE because of the response. Loved the Linux experience, hate the Micro$oft approach. So THEN decided to load Ubuntu on my Chromebook. Ubuntu with Unity…too slow. Went with Ubuntu XFCE, and love it. Bottom line: There are some great Linux distros that will be extremely satisfying depending on needs and equipment. Mint Cinnamon is my favorite…smooth, easy to customize, just plain works. Will be upgrading to Mint 17 in a few weeks or so. I like Xubuntu better than Linux Mint 17.3 Mate. With Mint you can't auto change the wallpapers. You can with Xubuntu 14.04. It hand holds too much for me.